Breast cancer is one of the leading causes of death in women. Studies have indicated that cure rates dramatically increase if the breast lesion can be detected at a size less than 1 centimeter, which is too small for the lesion to be palpable. 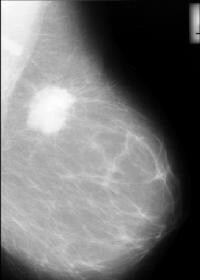 The only way a lesion this small can be detected is through screening mammography. Our goal has been to develop computer-aided diagnostic techniques for automatic detection and classification of breast tumors. This research is led by Prof. Edward J. Delp at the Video and Image Processing Laboratory (VIPER). In the past several years there has been tremendous interest in image processing and analysis techniques in mammography. One common approach for detecting abnormalities in mammograms is to use a series of heuristics, e.g. filtering and thresholding, which may include texture analysis to automatically detect abnormalities. These heuristic methods suffer from a lack of robustness when the number of images to be classified is large. Statistical methods have also been developed to address this problem. Our new statistical algorithm partitions a mammogram into homogeneous texture regions using random field model. M. L. Comer, S. Liu, E. J. Delp, "Statistical Segmentation of Mammograms," Proceedings of the 3nd International Workshop on Digital Mammography, June 9-12,1996, Chicago, pp. 475-478. The readme file , compressed postscript file, PDF file, and the ftp site. 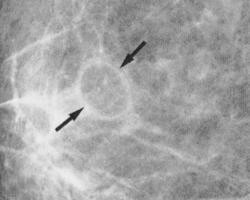 Among breast abnormalities, spiculated masses having a stellate appearance in mammograms are highly suspicious indicators of breast cancer. Unfortunately, the detection of spiculated lesions is very difficult. Their central masses are usually irregular with ill-defined borders. Their sizes vary from a few millimeters to several centimeters in diameter. We have proposed a new multiresolution scheme for the detection of spiculated lesions in digital mammograms. S. Liu, C. F. Babbs, and E. J. Delp "Multiresolution Detection of Spiculated Lesions in Digital Mammograms," submitted to the IEEE Transactions on Image Processing, The readme file, compressed postscript file, PDF file, and the ftp site. S. Liu and E. J. Delp, "Multiresolution Detection of Stellate Lesions in Mammograms," Proceedings of IEEE International Conference on Image Processing, October 26-29,1997, Santa Barbara, California, pp. II-109-II-112. The readme file, compressed postscript file, PDF file, and the ftp site. We propose a novel approach to the problem of computer aided analysis of digital mammograms for breast cancer detection: namely, the development of algorithms to recognize unequivocally normal mammograms. The block diagram at right shows the normal tissue identification and removal algorithm. We will refer to the mammogram that results from the removal of normal structures as the residual image. Any abnormality that may exist in the mammogram is therefore enhanced in the residual image, which makes the decision regarding the normality of the mammogram much easier. Eventually, the computer-aided diagnostic software would prescreen mammograms with quantifiable high accuracy and presents to the human reader a reduced number of more difficult cases, together with the residual images. Hence it gives the human reader both a reduced work load and extra clues or prompts, which would improve his or her overall performance. S. Liu, C. F. Babbs, and E. J. Delp, "Normal Mammogram Analysis and Recognition," Proceedings of the IEEE International Conference on Image Processing, October 4-7,1998, Chicago, Illinois. The readme file, compressed postscript file, PDF file, and the ftp site. Research in the processing, compression, transmission, and interpretation of digital radiographic images requires evaluation of a wide variety of test images, varying in format, in spatial resolution, and in anatomic content. To evaluate the diagnostic performance of observers using novel versus conventional image formats, large number of test images containing known abnormalities are required. 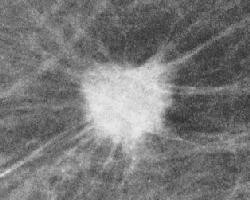 Generating synthetic mammograms provide a flexible, easy-to-use research tool to explore digital techniques in mammography, as well as a potential aid to training of radiologists in early breast cancer detection. 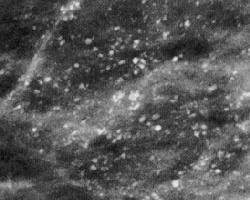 Our recent publications in Medical Imaging and Image Analysis. A complete set of recent publications at VIPER.